Julia Strophes spends a lot of time getting her “guests” prepared for the party she has obtained invitations for. It's a dark lit party of course; Julia introduces Hernandez to the host, Lady Tanae Borella, a patron of the Joyous Choir. Lady Borella demands that Hernandez or his entourage entertain her. Calpurnia sternly plays the role of bodyguard, but Aenid does a knife-throwing trick that earns awkward applause. Calpurnia Jemadar notices someone who seems much more important than the other guests, surrounded by even more sycophants than Lady Borella. He looks like an older, long-time user of rejuvenants, dressed in a riot of colours. He is Lord Raephen Verence, an important noble in service of the Calixis Sector governor, more important than than everyone else here put together, and accompanied by bodyguards both obvious and discreet. Xanthia notices a man going around with a Harmony meter, generating much tittering and giggles. She wanders over in his direction; the man makes a play of pointing the Harmony meter and says that she is barely registering at all. Rollando Hernandez notices a more poorly dressed woman, hovering around and trying to remain unnoticed. When she notices that Hernandez has seen her, she tries to stay out of the way, but allows herself to be cornered. She says she was granted an invitation to the party as a reward for her work in the Middle Hive for Joyous Choir. Rollando discreetly crosses Xanthia's path and asks her to check the woman for psychic ability; Xanthia's check reveals that the woman has no psychic talent. 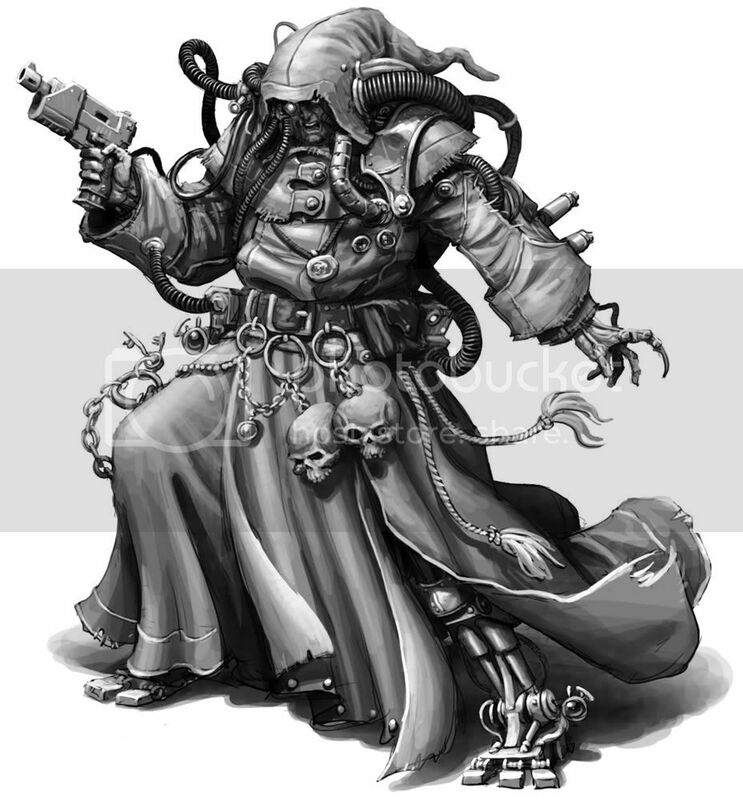 Xanthia finds no unexpected psykers or heretical insignia among attendees. Rollando then wanders over to the man wielding the Harmony meter, bragging of his wealth on Fenksworld, and asks to be tested. The man makes a show of testing him for “Trueness” and getting a high result. He offers to introduce Hernandez to the Joyous Choir, who he says wants to make all citizens of the Imperium happy by aligning their lives more closely with the Emperor's intent for them. Rollando shows interest, asks if the man has a place of business; why yes! The Joyous Choir will be hosting a meeting at the Alabaster Court on the next day. At this point, little shot glasses with a blue glowing liquid are brought to the guests, and the hostess invites them all to drink. Hernandez quaffs his, and feels a warm glow of interconnectedness between all beings in the room. Xanthia examines the partakers and a dark look comes on her face. She signals to the rest of the team to take Hernandez to a more private spot, then tells him he should not have any more of this drink. The stuff has a psychic signature, and Xanthia even suspects that it's alive. She wants a sample to bring back. Rollando leans over the balcony – a mile high above the Middle Hive – and upchucks, but nothing blue comes out. They look around to check who is not drinking; this include Lord Verence and a lot of the older guests. The older the guest, the less likely they seem to be to drink the strange brew. Lady Borella, however, is partaking, as did the woman from the Middle Hive. Aenid palms one of the drinks and saves it for future analysis. An androgynous servant approaches Rollando, asking on behalf of Lady Borella how her guest is enjoying the party. Rollando says he is very happy with the party; he asks what the blue liqueur was, but the servant neatly sidesteps the question by saying it is a local vintage. After the party, Aenid and Xanthia discreetly follow the woman from the Middle Hive, while Rollando and Calpurnia, with Julia, return to Lord Strophes. Calpurnia questions Laurent Strophes about Lord Verence; he is reputed to be a fop, but Lord Strophes believes this to a carefully cultivated facade by a man smarter than he lets on. He was probably at the party “to see and be seen.” Everyone suspects the blue liquid was pharcosia. Aenid and Xanthia ditch the more ostentatious parts of their festive garments, and tail the Middle Hive woman for the better part of an hour and a half as she goes home to a dilapidated building that must once have been the gatehouse of a large estate. There is a big Joyful Chorus sign outside as well as a sign for a soup kitchen, and the building can hold perhaps 30 or 40 people. Xanthia carefully examines the building and pronounces it free of any psychic traces. They return to the Upper Hive. Calpurnia sends the sample of suspected pharcosia to Narthax, along with a report. A communiqué soon follows, requesting Xanthias presence at headquarters. Another message comes from Orday a bit later, asking to meet in the morning – his departure has been moved up and he wants to dispose of his merchandise in a public area, in a large open-air market called The Hustle, beneath “the broken moon.” Aenid thinks this must refer to a broken statue of an Imperial Guardsman bearing a cracked shield showing a moon, which she knows is in the Hustle. Aenid, Calpurnia, and Rollando head out to the Middle Hive and the Hustle, and take up position under the statue. Rollando spots Orday, approaching with a briefcase in hand. Although they are trying to spot would-be ambushers, they fail to see them before a sniper blows Orday's head off. Someone in black robes repels down from above, and starts running for the briefcase. The attacker's limbs are bending unnaturally and he twists his torso around to shoot behind him as he runs away. Aenid is hit by his parting shot. Rollando shoots back, but fails to connect. Calpurnia's shot hits squarely with two consecutive shots, setting the robes on fire and revealing that the attacker's body is almost nothing but augmentics. Aenid shoots the case out of his hand, forcing him to drop it. The attacker comes to a screeching halt, his augmentics sparking on the pavement, and whirls back to reach the case again and slap something onto it. Rollando takes a shot and hits him too. Aenid hits with another shot; he throws the case far in one direction and starts running in the opposite. Calpurnia shouts: “Aenid! Get the case!” and shoots at the sniper again, winging him. Rollando follows suit with a shot of his own, sending sparks and bits of augmentics flying, but the enemy keeps going! Despite another graze by Calpurnia and another solid hit by Rollando, he continues running away, and his return fire misses Rollando. Meanwhile, Aenid plunges through the crowds and grabs the briefcase; it looks like a melta bomb has been attached to it. Aenid wrenches the case open and grabs the dataslate inside, yelling: “Get away, everyone! It's going to blow!” She dives for cover as the case goes up, receiving only minor burns despite the fiery explosion. Calpurnia fiercely orders the opponent to stand down as he runs away, and sees him flinch visibly, but he continues off and out of reach. Rollando and Calpurnia go check on Aenid, and take her back to safety. All this goes, with the daily briefing, to Narthax.